The Orchestra, a photo by moyalynne on Flickr. 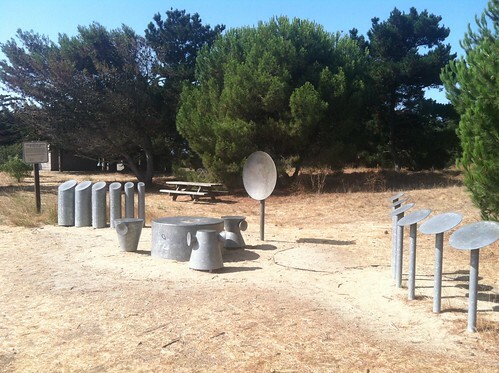 Orchestra For Natives Of The Future is a group of sound-making metal sculptures near the Plover Group Picnic Area in the almost-left-behind Candlestick Point State Recreation Area. The Orchestra was created in 1988 by Bill Buchen, Mary Buchen, and Pat Fitzgerald. Candlestick Point may not be the most beautiful park in the Bay Area, but its low-key natural vibe in the middle of the urban hustle (and practically right on top of Candlestick Park) make it a valuable natural gem. The shoreline is mostly craggy and rocky and extends out on a finger into the Bay between SFO and The City. With views to their backs of the relics of Hunters Point’s naval shipyard, anglers stand out on a pier and bring in lots of fish (mostly smelt) to take home and feed their families, to toss on barbecues right there, or to sell somewhere else later. The ground is littered with rodent holes and I’m pretty sure the common squirrel owns the territory and can be found everywhere you step. This is a calm park in general and you can hear birds singing against the distant freeway and airport roar. And with the hidden secret Orchestra, it makes the park a great place to explore and a good meeting spot for a picnic and a jam session. Between Plover Group Picnic Area and the Orchestra area, there are about 10 picnic tables, at least one of which is in shade at 11am when I was there this morning. This is a good place to come when the rest of the Bay Area is foggy — if there’s a chance for sun or at least warmth, it should be found here. Though the grass is weedy and unkept (and looks basically dead), there are plenty of bathroom facilities (whether they’re open or not I’m not sure, but the outsides look clean), and barbecues and water. Dogs are allowed, on leash. Aside from people fishing and people jogging, I’ve seen barely another group here enjoying any of the other picnic areas. And we’ve nearly lost this state park. In June 2012, the park was one of 16 scheduled for closure in the Bay Area, but although the others had received temporary reprieve due to an influx of cash from various “deep-pocketed saviors,” Candlestick Point, located in one of the City’s poorest neighborhoods, had no such savior forthcoming. To find the Orchestra For Natives Of The Future, go to Candlestick Park, driving all the way around to the bay side, and you’ll see the state park signs for Candlestick Point. Park in the state park parking lot, which is literally right across the street from the Candlestick Park parking lot. Parking is closed Thursdays and Fridays and comes at a premium on days when the 49’ers have a home game, so you should avoid those days if you’ve come to picnic. After you park, walk up one of the access roads to where the bay forms a cove, and you’ll find the Orchestra in an open space next to the Plover Group Picnic Area. You can’t reserve specific sites, but you can come when the park opens (at 10am?) to sit at the Plover Picnic Area if you want to barbecue next to your drumming jam session. The rangers say to call them for a ~$50 special event permit if you’re planning a party for 50 people or more. You can visit this special place and contribute to keeping your valuable state parks open today! I LOVE this, Ranger Moya.